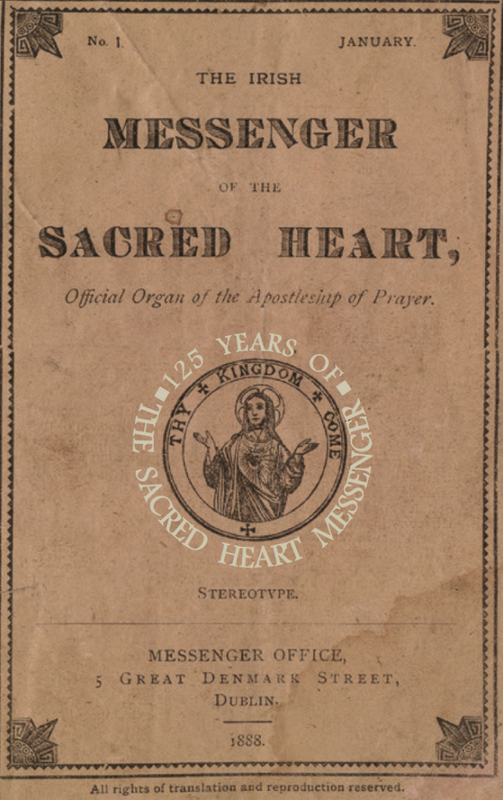 First issue cover of Irish Messenger of the Sacred Heart founded by Fr. James Cullen (125th anniversary facsimile). Premiere devotional magazine of Catholic Ireland. This old, long out-of-print piece brings together two main concerns of this website: the Sacred Heart of Jesus and Catholic Ireland. It is also provides an answer, or at least the beginning of an answer, to a question I have been grappling with for years. To wit: How did devotion to the Sacred Heart of Jesus become so very central to Catholic Ireland? This is to say, more central than in any other Catholic culture, with the possible exception of France where the Devotion was born (at least as a popular cult). Personally, this question has haunted me for years. For having lived in both Catholic Ireland and France, it was clear that in both countries the Sacred Heart devotion assumed a popularity that clearly outpaced other Catholic cultures – including, for example, that of Spain (where I have also lived). As I just indicated, the situation of Catholic France is easily explained. But Ireland, why Ireland? Was it simply that Irish Catholicism drew so abundantly from France? Or was there more to it than that? For indeed, from everything I could see, it seemed that in the past devotion to the Heart of Jesus had been even more pronounced in Ireland than in France! I have hunted for answers – and at last found this old piece which provides, at least, a valuable contribution to the puzzle. This piece is taken from The Life and Work of Rev. James Aloysius Cullen, S.J. by Lambert McKenna S.J.. These days, Father James Cullen (1841-1921) is best remembered for his role in combatting Irish alcoholism. He was the founder of the Pioneers one still finds in Ireland today – or the Pioneer Total Abstinence Association. However, as this rich extract from his biography makes abundantly clear, Father Cullen was a dynamo who was was responsible for far, far more than just the Pioneers. Even a slight knowledge of the Irish people of the present day brings home to one that, though a tender devotion to the Heart of Christ is as old as Christianity in Ireland, it has of late years been immensely quickened. The Devotion to His Sacred Heart is now a striking characteristic of the spiritual life of the country. This result may, we think, be attributed to the wonderful efficiency – to which the Vicars of Christ have borne testimony – of the Apostleship of Prayer; and we may see, too, the working of God’s Providence in entrusting that Apostleship to Father Cullen. There is little more we need add. For this rich piece supplies a host of answers in itself, just as it evokes the increasingly lost world of Catholic Ireland. The extract is barely ninety years old – and yet it can open one’s eyes to a world increasingly, unimaginably remote and alien. But enough of tragedy – I hope those who love Ireland like myself can profit from this doorway into the past. I have certainly profited greatly and it is a joy to re-publish it at this site – R.B. From The Life and Work of Rev. James Aloysius Cullen, S.J. It is probably as a great Temperance reformer that Father Cullen will be best known to future generations of Irishmen. Yet all who had even a transitory acquaintance with him could not but feel that he was a Temperance advocate only because first of all he was a Christian apostle. The overmastering passion of his life was love of Christ; he hated intemperance chiefly because it robbed Christ of the souls for which His Sacred Hiart craved. Not merely was his advocacy of Temperance always derived from his apostolic spirit, but it was a comparatively late outcome of that spirit. As we have seen, not till 1874 did he take up the Total Abstinence cause with enthusiasm, yet at that time he had already won far and wide a reputation for his priestly virtues and zeal. From the very beginning of his priestly life the love of Christ was his passion. That love manifested itself at first chiefly in his devotion to the Blessed Sacrament, and, later on, more particularly in his devotion to the Sacred Heart. Indeed, to those who view his life in its proper perspective, he was first and foremost an apostle of the Sacred Heart. It was his success in promoting the love of the Sacred Heart, and in promoting Total Abstinence as a manifestation of that love, that forms his greatest title to glory. Before describing his work for the Sacred Heart in Ireland it may be well to review shortly what had been previously done for it by others. We shall say nothing here of the devotion to the Sacred Heart which springs up in souls as a spontaneous product of their love of Christ. The contemplation of the love which Christ bore and bears men has at all times fixed the attention of Christians on the Sacred Heart which pulsed with that love. Such devotion was frequent from the beginning of Christianity. There are no more touching prayers to the Sacred Heart than those of St. Bernard. St. Margaret Mary before the Sacred Heart – from Tuam Cathedral, Ireland. Design: Joshua Clarke. Photograph courtesy Andreas F. Borchert under the CC-BY-SA-3.0 license. The revelations made to St. Margaret Mary did not proclaim a new doctrine; they only brought to the attention of Christian souls a very touching and inspiring aspect of the age-old doctrine of Christ’s love. We are here concerned only with the growth of those organisations which the Church has employed, especially in later years, to promote among the faithful a warmer affection for the Sacred Personality of Christ, an affection which, as Christ pointed out in His revelations to St. Margaret Mary, is immensely increased by a constant dwelling on the loveableness of His Most Sacred Heart. Such organisations sprang up spontaneously in many parts of the Catholic world within a few years of the revelations made to St. Margaret Mary at Paray-le-Monial. In one of her letters (No. i ii) she expresses her joy at the foundation of a confraternity at Coutances, which had for its purpose the atonement of the insults offered to Christ, and the cultivating among its members of a deeper appreciation of His love. The most famous of all such confraternities was the one founded in 1797 by Father Felice, S.J. (who had also established a pious association of priests called the Fathers of Saint Paul) for the spiritual benefit of the boatmen of Rome. Its first centre was the church, Santa Maria ad Pineam, but in 1803 Pius VII gave it the status of an archconfraternity (i.e., the power of aggregating to itself other confraternities of the same kind and communicating to them its indulgences and privileges), and transferred it to the more central church of Santa Maria della Pace, where it still exists under the management of the Fathers of St. Paul. The Bishops of Ireland, seeing that this devotion was already established and greatly loved by the people in their several dioceses, petitioned the Holy See to have the festival of the Sacred Heart celebrated on a fixed day and with a proper Office and Mass in every church in Ireland. And the Pope of that day, Gregory XVI, granted the petition ‘in consequence of the great devotion to the Sacred Heart of Jesus that prevails in that kingdom. by the ex-Jesuits since their Order has been abolished, as a means of perpetuating their influence and of paving the way for their re-establishment. It must, therefore, be a matter of great suspicion when we find this society suddenly introduced at Maynooth soon after Mr. Kenney, an avowed Jesuit, had been elected Vice-President, and immediately after Dr. Murray had visited Rome, where the General of that Order resides. The connection is strenuously denied by the witnesses before the Maynooth Commission; yet, strangely enough, they allow that several of the superiors and two hundred students are members of the sodality. There were probably many other sodalities of the Sacred Heart established soon afterwards, but the earliest of which we possess records were founded at the Waterford Ursuline Convent in 1820, and at St. Peter’s Church, Phibsborough, in 1830. At Gardiner Street, Dublin, a confraternity of the Sacred Heart was directed during the years 1853 to 1855 by Father Henry Rorke, and by Father Mich. Kavanagh in 1856, after which time it appears to have died out. Cardinal Cuilen, Archbishop of Dublin, was very anxious that the devotion to the Sacred Heart should be vigorously promoted. The Jesuits in Gardiner Street, whom he first approached, considered that they had not a sufficiency of priests. He then applied to the Vincentian Fathers at Phibsborough, who undertook the task with earnestness. Through the intermediary of the Procurator of the Jesuits at Rome, they obtained a formal aggregation of their sodality to the parent sodality of Santa Maria della Pace. By this aggregation St. Peter’s Sodality (and the sodalities affiliated to it) were given all the indulgences which the Holy See had granted to the various prayers and devotions in honour of the Sacred Heart. Father Dixon, C.M., was the prime mover in this matter; through his exertions and those of his brethren, a large number of sodalities were aggregated to St. Peter’s in all parts of Ireland, but more particularly in the Kildare Diocese where Dr. Lynch, a Vincentian, was Bishop, and in the Diocese of Ferns, where Dr. Furlong was particularly enthusiastic in favour of the Devotion. Father Cullen, when at Enniscorthy (1866-80), established many of them, for instance, at Litter, Ramsgrange, Ballymahon, Wicklow, etc. Sodalities of the Sacred Heart were also established at Limerick by Father William Ronan, S.J., in 1873, and at Galway by Father Alfred Murphy, S.J., in 1874. In spite, however, of these excellent works, devotion to the Sacred Heart was as yet far from being a general characteristic of the spiritual life of the Irish people. It became this only after the Organisation and spread of the Apostleship of Prayer; and it is to Father Cullen, more than to any man in Ireland, that the spread of this pious organisation IS due. Before we describe this, the biggest achievement in his life, a few words as to the nature and origin of the Apostleship of Prayer, and as to the extent to which it had spread in Ireland when Father Cullen devoted himself to its propagation, may not be out of place. The “One Mediator of God and Man, the Man Christ Jesus, who gave himself a redemption for all” (Timothy, 1. 3) is “ever living to make intercession for us” (Hebrews, viii., 24). In His unceasing prayer to Heaven and on our altars, Jesus Christ is seeking the conversion of sinners, the preservation of the innocent, the strengthening of the faithful; in a word, the coming of the Kingdom of God upon earth. To make these interests of Christ our own; to enter into the intentions of His Sacred Heart; in union with that Heart and in imitation of it, to offer up the prayers, deeds and sufferings of our day is the object and the work of the Apostleship of Prayer, or (as it is also called) The League of the Heart of Jesus. This League had its origin in a pious association which, in 1844, Père Gautrelet organised among the Jesuit scholastics at Vals, near Le Puy in France. Approved almost immediately (1849), and subsequently enriched with a profusion of indulgences by many rescripts of Pius IX and Leo XIII, it grew with prodigious rapidity, until at the present day it contains over 40,000,000 members, embraces nearly 60,000 centres, and is propagated by fifty-three Messengers in thirty-three languages. This extensive Organisation has for its permanent head the General of the Society of Jesus, who, however, delegates his powers to a General Director living at Toulouse, where the central office of the League is situated. Under him are Diocesan Directors (named by the Bishop of each Diocese, and instituted by the General Director); under these again (and appointed by them) are Local Directors in charge of the various branches. The members of the Apostleship are bound together by their voluntary promises of performing certain practices of devotion. According to the number of these practices, they belong to the First, Second or Third Degree of the Apostleship. The First Degree consists of those who offer daily their thoughts, words and actions in union with the Sacred Heart for the intentions for which Our Lord is making perpetual intercession. This Degree is essential for membership. The Second Degree consists of those who, in addition, offer daily one Our Father and ten Hail Marys for the intention of the Sovereign Pontiff. Especially rich are the indulgences granted to members of the Third Degree, that is, those who, in addition to the practices of the First Degree, undertake to make a monthly or weekly Holy Communion in reparation for the insults and neglect offered to Jesus Christ in the Blessed Sacrament. These members group themselves in sections of thirty or seven, so that each group may offer every day to the Sacred Heart this Act of Reparation. Besides the ordinary members of the Apostleship, there are also Promoters, who undertake to spread the Apostleship in their neighbourhood. After a probation period of six months, they receive a special diploma, and enjoy special spiritual advantages. All members of the Apostleship of Prayer who had been received before 1879 were by a rescript of that year made ipso facto members of the Roman Archconfraternity of the Sacred Heart of which we have spoken above. By the same rescript those who were to be received after 1879 could be admitted to the same Archconfraternity by any Director of the Apostleship. Their names were to he inscribed in the register of some confraternity of the Sacred Heart-either one already existing, or one constituted anew by the Bishop of the diocese. This pious Organisation received a great impetus from the zeal of Père Henri Ramière, S.J., who was one of its first General Directors, and who founded in 1861 the first Messenger of the Sacred Heart. Very shortly after this date we find the Apostleship established in Ireland by Father John Curtis, S.J., at the Ursuline Convent, Waterford, in 1863. This was, as far as we can ascertain, the earliest instance of its establishment in Ireland. Other very early foundations (in 1864) were those of the Loreto Convent, Gorey (established by Father Cooke, O.M.I. ), and of the Mercy Convent, Longford. There is some reason for thinking that Father John Curtis, S.J. ; Father Mathew Seaver, S.J., and Father Robert Kelly, S.J., acted as Directors for Ireland between the years 1863 and 1873, though there are no official records of their appointments. Branches of the organisation existed at Gardiner Street Church during 1866-1867 under Father J. Lynch, and (having apparently lapsed for two years) during 1869-71 under Father Norton. The English Messenger of the Sacred Heart for December, 1872, gives a list of parishes, convents, colleges, etc., in Ireland where branches of the Apostleship had been set up. A much fuller list is given in the Irish Monthly, October, 1873, which in the beginning was intended by its editor to be an organ of the Apostleship. On Passion Sunday (March 3oth), 1873, an event occurred which was of decisive moment in the religious history of Ireland. On that day all the people of Ireland assembling in their various parishes in obedience to a Pastoral which the united episcopate had issued in January, solemnly and irrevocably consecrated themselves and their country to the Sacred Heart of Jesus. The event was unique. Other countries had consecrated themselves diocese after diocese. Ireland was the first to do so as a nation. This manifestation of Ireland’s love for the Redeemer was the natural result of the devotion to His Sacred Heart which had been growing in the previous years. It was hastened by a desire to make reparation for the outrages which had lately been offered to the Sacred Heart during the Kulturkampf in Prussia, where the Government had sent troops to enter by force many churches where crowds were engaged in this devotion, and to disperse the congregations. Owing to this great event of 1873 there ensued a great increase in the numbers of Apostleship of Prayer branches, as well as of confraternities of the Sacred Heart. Father Matthew Russell, S.J., who founded in that year the Irish Monthly (or, as he first called it, CATHOLIC IRELAND. A Monthly Memorial of our Country’s Consecration to the Heart of Jesus), intended to make it an organ of the Apostleship of Prayer. Various reasons, however, diverted him from this intention, but in the same year he became Central Director of the Apostleship for Ireland. With the kind permission of his friend, Mr. M. H. Gill, he used an office in the establishment ” McGlashan & Gill,” 5° Upper Sack-vile Street, Dublin, where he attended daily, receiving names, sending out diplomas, etc. He continued doing so until 1887, with the exception of five years, during which Father E. Murphy had charge of the work. Except for his abundant zeal, however, Father Russell’s gifts were not the peculiar ones required for this task. His artistic nature was ill-suited for the dry routine of office-work. Moreover, being attached to Gardiner Street, which he left comparatively seldom to give retreats, he had no opportunities of personally visiting the branches of the Apostleship and of stimulating their activity. Neither had he at his command any journal to serve as its organ. The English Messenger had, it is true, a certain circulation in Ireland, mostly among the convents; but, being English, it devoted less attention to things of Irish interest, and besides was not popular either in style or price (6d.). Consequently the Apostleship in Ireland seems,especially during the years 1883 to 1887, to have waned considerably. In many of the places where it had been founded it had died out; in most of them it was not worked with vigour. Father John Curtis, S.J., always felt a keen interest in it – an interest which was quickened by his meeting with Père Ramière who had come over from France in 1883 – but was too old to do much. Father Russell did his best, but recognised that the task was beyond his powers. Father Dignam, S.J., who had become Central Director for England in 1882, was much exercised at the little that was being done in Ireland for the Apostleship, and hoped that his new and cheap English Messenger, brought out in 1885, would do something towards realising the magnificent possibilities which, as he often declared, lay before the Apostleship in such a Catholic country. He was disappointed in this hope. A chance word of his, however, was the indirect cause or at least the occasion – of Father Cullen’s undertaking the work of the Apostleship. Mrs. Taylor, now Mother General of the “Poor Servants of the Mother of God,” had just returned from Rome where she had obtained the solemn approval of her Institute, and was passing through England on her way to Ireland. During her stay in Dublin she was not unmindful of the injunction. She interviewed the Director of the Children of Mary at Gardiner Street, and induced him to restart the Apostleship. Shortly afterwards, she met Father Cullen in a book-seller’s shop. As the reader will remember, she was an old friend of his, had a very high idea of his sanctity, and owed to him many of her subjects. In spite of this – or because of it- she upbraided him, as though he were responsible for the backward condition of the Apostleship in Ireland. “You are worse since you have become a Jesuit,” said she. Though he seems to have answered her somewhat hotly, probably taking her words as a reflection on the Society, it is remarkable that in little over a year afterwards he had got his Diploma as Central Director for Ireland. Not that this interview with Mrs. Taylor can have enlightened him for the first time as to the efficacy of the Apostleship of Prayer in promoting devotion to the Sacred Heart. Even before entering the Society, we find him in his Diary (1878) speaking with admiration of it. But it is certainly remarkable that, from 1887 on, we find that the Sacred Heart – to which of course all through his life he had a tender devotion – dominates, as it never had done before, all his thoughts. It became the great characteristic of his spiritual life, and at the same time the Apostleship of Prayer began to appear to him as the most perfect means of spreading the love of Christ’s Heart. O Most Holy Trinity, kneeling before Thee, I ask Thy blessing on the work of the Apostleship of Prayer. I feel I am yet in the dark as to how to work it and to make it a mighty lever for raising Ireland as a nation to the fervent adoration and love of the Heart of Jesus;” and again: “Make it a band of hearts united in the desire to love and serve the Sacred Heart. Sustain me by Thy power, warm me with Thy love, guide me with Thy light. He was appointed Central Director for Ireland by the Provincial, Father Thos. Brown, 3rd October, and soon after received his Diploma (signed 8th November, 1887) from Rome. He had already been convinced – chiefly owing to the vigorous representations of Father M. Russell – that to make the Apostleship a success an Irish Messenger was indispensable. But how was he to start it? He was already overburdened with work; he knew nothing about managing a journal; and he had no money. A publishing firm to which he applied for information as to the probable cost of printing, etc., immediately made him an offer to print and publish entirely at its own risk and, of course, profit. This offer, which he naturally refused, encouraged him greatly as to the prospects of the new paper being able to pay its way; and he Set about looking for money. “One pound” was the answer. Quite thankful and satisfied – he often told the story afterwards – with this first contribution, he went forth to get additions to it, and soon had enough to pay for the first number of the Messenger which appeared on the ist January, 1888. He transformed a room, which the Rector of Belvedere lent him, into an office, and there began the whole work of conducting the Apostleship, as well as of editing and managing the Messenger. The Provincial, Father Thos. Brown, one day passing Belvedere, is stirred by a vague curiosity to call in and see Father Cullen, to whom he dimly remembers having given permission to publish some small pious magazine. He is shown into a room in which – to his consternation – he finds a clerk surrounded by big packages. “I don’t know,” said the clerk. “He is gone off to Cork. All testimonies agree that these simple exhortations had a powerful effect in arousing the piety and fervour of his young hearers. Candles before the Blessed Sacrament. Two other objects of his solicitude with regard to the Blessed Sacrament may here be noted. Everywhere he went he used to urge that a many-branched candelabrum should be erected before the Altar where the Blessed Sacrament reposed. He rather discouraged – while not actually condemning – candelabra before other shrines or pictures, especially in the absence of anything of the kind before the Real Presence. He recommended these Sanctuary candles as an external sign by which the faithful could show their faith and veneration for the Blessed Sacrament; also, just as other external signs such as the Sign of the Cross, a kneeling posture, etc., have a reaction upon the interior consciousness and thus favour devotion, this sign of reverence would, he considered, do much to awaken in the hearts of the faithful the feeling of which it is the external expression. For much the same reason he favoured Congregational Singing. While a member of the House of Missions, he had established it in the church of the Fathers, and he always tried to establish it in the parishes where he gave missions and retreats. Whenever possible, he did the same all through his life, and constantly wrote about it in the Messenger. As late as 1915 we find him starting it in the Parish Church of Rosslare. One of his last works before he gave up the editorship was to promote (in 1903) the practice of assistance at daily Mass by launching one of his numerous Leagues. It was called the ” Daily Mass League.” Later on, in 1911, he applied (through the Archbishop of Dublin) to Rome for special indulgences. The Brief in which Pope Benedict XV graciously granted (September, 1915) these, is displayed to-day at the door of nearly every church in Ireland. This entry was posted in Tridentine Archive and tagged Catholic France, Catholic Ireland, Sacred Heart, Tridentine Church. Bookmark the permalink. Post a comment or leave a trackback: Trackback URL.